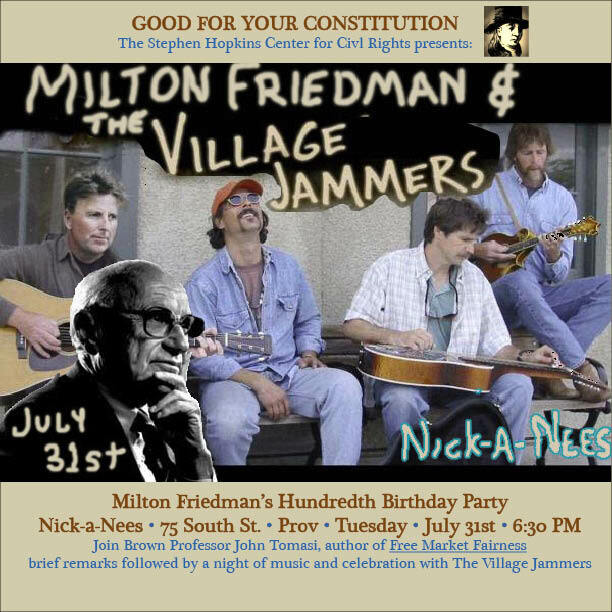 Milton Friendman's Hundredth Birthday Bash! Tuesday, July 31st at 6:30 PM at Nick-A-Nees, 75 South Street, in the jewelry district of Providence. We're going to start at 6:30 on Tuesday evening with a brief program featuring John Tomasi who pioneered the Political Theory Project at Brown University. He will introduce his work, Free Market Fairness, reconciling beliefs in economic liberty, like Friedman's, with a liberal respect for securing the capacity of responsible self authorship for all our fellows and a concern for just outcomes relative to the least fortunate. This is groundbreaking work integrating libertarian and liberal philosophies, and propelling Tomasi to the head of the debate over whether any such reconciliation is really possible. Because Tomasi himself hails from the classic liberal tradition, we are engaged in a search for a modern liberal foil to offer critique of his presentation. And the setting and musical denouement promise a diverse audience that may engage him as well. While there is a great deal of abstraction in his approach, Tomasi continually returns to real world ideas and metaphors. He proceeds with a reticence that reflects the problems of phiiosophy as a flyover discipline, trying to theoretically debate morals for systems to govern a real world. Most especially, his insights on work as an important defining pursuit speak to me in a way that made pursuing his ideas for Free Market Fairness across 250 pages well worth the effort. With support from the Friedman Foundation for School Choice, we've been able to purchase some copies of John's book to distributed at a deep discount afterwards for those who dare to follow. But before much more than an hour has gone by, the stage will give way to our good friends The Village Jammers. You might call them a gypsy swing quartet but it is just as safe to call their original music uncategorizable. and infectious. Hope to see you there to enjoy an evening with John Tomasi and great music from The Village Jammers. The mission of the Stephen Hopkins Center for Civil Rights is to protect the rights that Americans recognize as fundamental.The center litigates in areas of fiscal responsibility and transparency, school choice. free speech, and property rights to assist individuals the government has harmed, and ensure all Rhode islanders enjoy their constitutional rights. The Stephen Hopkins Center for Civil Rights is proud to announce the second of its ongoing “Good For Your Constitution” lecture and debate series. As free market advocates, our objection to the 38 Studios deal was not based on specific risk. Rather we objected to the unprincipled nature of the EDC winner picker model of support for signature businesses – whether employed in perceptually successful cases such as Fidel- ity or flops like 38 Studios. Our concern at this juncture is not to join the political chorus attempting to assign blame or examine the connected insiders who benefitted from the deal. Rather, we seek to encourage the state to apply due diligence to unwinding 38 Studios (and perhaps EDC itself) that it did not apply to getting into the deal in the first place. Presently, the public and many policymakers consider the 38 Studios legislation as evidence that the taxpayers are now ‘on the hook’ for the losses. As a matter of law, this appears inaccurate. It is constitution- ally impossible for a sitting legislature to pledge financial support from a future legislature. This violates both the constitutional bar on borrowing without a referendum of the people and the republican principle of elected representation. If newly elected representatives cannot change policy set by previous legislatures, then elec- tions are essentially meaningless. It is not simply abstract constitutional second guessing that suggests the fate of the 38 Studios bond- holders is a policy question and not a question of law. The panel will compare the legal theories undergirding pension reform to this context. 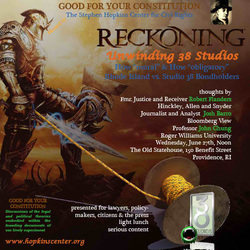 In so doing the Stephen Hopkins Center hopes to remind policymakers that the reliance of bondholders upon the state to make good on promissory policy with regards to 38 Studios is very similar to the reliance that state employees placed upon receiving, from a later legislature, pensions promised by an earlier one. Our panelists do not present this caveat as a ‘get out of jail free’ card. There are policy ramifications to however Rhode Island choses to address this situation, with options ranging from no support for bondhold- ers to paying out the issue in full, or hybrids such as backing the investors’ capital but not their interest. To date, public discourse has focused on ‘how did we get into this’ and ‘how to avoid this in the future’, important questions, but not the policy imperatives of our immediate predicament. Indeed, the Rhode Island Senate has suggested it will convene after the 4th of July to consider refilling the EDC board. Is that a good idea without first addressing this elephant in the room? The Stephen Hopkins Center is proud to present a panel on issues that need to be addressed right now - because our state’s economic future cannot await our summer vacations. Join a lively panel intended for the press, the policymakers and the public. Come join the Stephen Hopkins Center for Civil Rights for lunch as we welcome constitutional litigator and Georgetown University Law Professor Randy Barnett for a discussion of the lasting contributions made to liberty by our nation's sixth Chief Justice, Salmon P. Chase. Then join Brown's political theory project Prof. Barnett's debate with Harvard Law Prof. Charles Fried as they tackle the topic "We, the Insured: Is the Healthcare Mandate Constitutional?" The mission of the Stephen Hopkins Center for Civil Rights is to protect the rights that Americans recognize as fundamental.The center litigates in areas of fiscal responsibility and transparency, school choice. free speech, and property rightsto assist individuals the government has harmed, and ensure all Rhode islanders enjoy their constitutional rights. Judicial Review in Deepwater: Is “Hard Look” review the implementation of, or inimical to, the separation of powers? 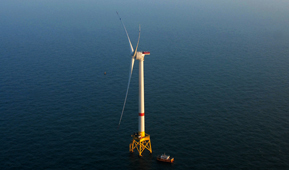 Naturally, this is music to the ears of those of us who consider that just such trading, bias and preference permeate the proceedings relative to National Grid’s contract with Deepwater Wind. But, it should be recalled that much of the original concern giving rise to “hard-look” was that administrators would favor the economic status quo over newly minted environmental and consumer legislation. What emerges is the extent to which “hard look” is a procedural tool in effect, if nonetheless a substantive inquiry. It doesn’t favor business over ecology, or vice versa, but ensconces a certain cyncism regarding the extent to which contemporary fads and factions can drive administrative decision making, whatever their ideological composition. The foregoing must be conceded to be the argument of those advancing “hard look” in this case. The alternative view is that “hard look” is a beard for judicial activism under which the court is usurping roles unsuited to the judicial branch. Administrative agencies present a difficult challenge for the application of the separaton of powers and “hard-look” can be simultaneously viewed as established a proper check and balance to unelected decisionmakers, or the court inappropriately inserting itself into policymaking. At a preliminary hearing in the Deepwater Case, Chief Justice Suttell highlighted this tension when he reached past the standing question at issue to voice his concern that setting aside the contract, or the law that mandated it, would leave RI without a policy. This itself can be read two ways. Fealty to legislative policymaking, or a bias that a new policy is superior to the status quo. 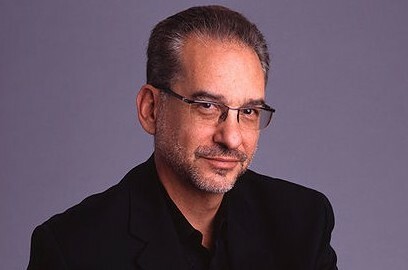 To address this dualism we are most proud to invite the critique of Professor Steven Calabresi, one of the country’s foremost constitutional theorists and a co-founder of the Federalist Society -- whose patron saint, James Madison, is considered the author of the American system of separated powers. Having gained an early reputation with his students of constitutional law at Brown for a balanced and thorough approach, we fully expect that his presentation will address both the strong and weak points of our argument, and encourage Rhode Island’s legal and policy community along with its entire citizenry to attend and welcome Professor Steven Calabresi to the political theory discourse of our state, even as he has already enriched that at Brown University.